MyDAC is an enhanced component library for fast direct access to MySQL from Delphi, C++Builder and Lazarus, supporting Windows, Mac OS X, iOS, Android, Linux, FreeBSD for 32-bit and 64-bit platforms. 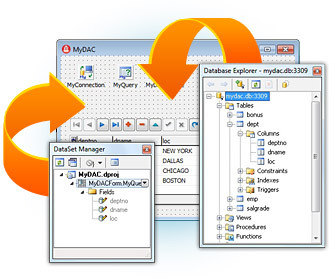 MyDAC includes full support for all MySQL data types and features, including support for locking, SET and ENUM types. Main advantages include direct access to MySQL data, Local Failover support, optimized code base, advanced design-time integration.